Any thoughts? my HOA had threatened to let them into my condo to inspect the fire sprinklers visually. I am not home that day. They've threatened to take the locks off using a locksmith if I don't give them a key. I do not feel like giving them a key do to the recent burglaries. 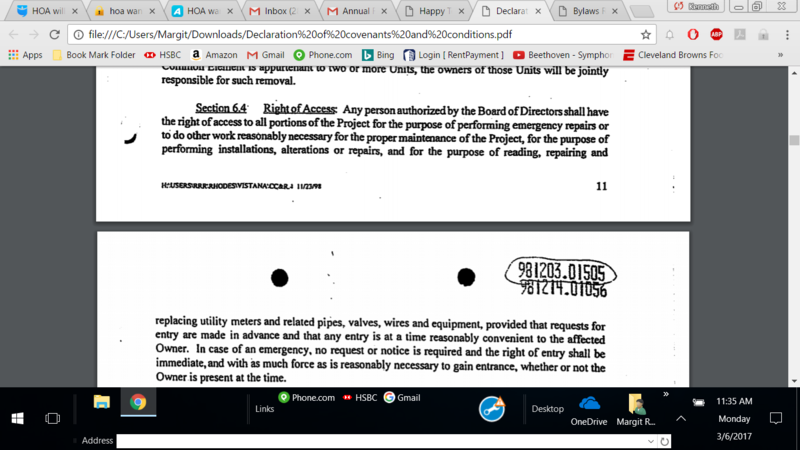 Our bylaws state HOA may enter if an emergency, however since the inspection company does this 4 times a year and I hardly consider this an emergency what can I do? @Teddy Johnson You should avoid the conflict and arrange for a time that mutually works. HOA's can make it painful. You want to be on their good side. Trying to fight it, even if you are right, will only make things more difficult. I just spoke with them and they refuse to reschedule and will remove the locks that day. According to bylaws they can only access if an emergency. The inspection company told me last year they are there 4 times a year and if they didn't make it that time they would mark the unit down and be there the next time. @Teddy Johnson Your HOA should have a key to your unit/Home at all times. If there is an emergency and they need access, you could be liable for lots of $$ if they couldn't get in to resolve a situation. Give them a key, let them enter and be done with it. Dont stress over such a minor issue. Check with the police. Maybe this could be considered a burglary. HOA manager here... if there truly is nothing in the covenants or other documents allowing them access then you have a case for making their lives miserable if they enter your premises without permission. That said - what's up with the policy of four times a year? Is it a state law? Insurance requirement? Older building? and - do they schedule some of the inspections for evenings or weekends when most people can be available? As a manager I wouldn't want the liability of entering someone's home without them present. I'm a Realtor too - and I know that the liability issues can be great. I forgot to mention there have been several burglaries this year where burglars had a key to get in. My number one concern is someone is making copies of keys at the HOA. After reading the bylaws, they do have a right to enter in an emergency, but this is not an emergency to visually inspect smoke detectors. In addition, the bylaws state that the HOA in non-emergency situations must schedule an appointment with me when it is convenient or reschedule to when it is convenient. What is my recourse when I get home on Wednesday and the locks are missing. They do it four times a year because we have 32 buildings and it is more convenient for HOA to break it up in quarters. Since they only need to do it once a year per unit, and will be here 3 more times, I've asked to reschedule in advance for next quarter. HOA says they do the inspection for insurance purposes. I am not a difficult person, and will gladly let them in once a year when I am there. I usually work from home and have plenty of time to let them in. It just so happened that I needed to leave town to handle an emergency at a rental (a real emergency, flooding). They only schedule between 9 and 5 when most people are not available. I would suggest getting lockbox or key code system. Give them it so they can have access for the one time (Then remove the lockbox or remove their code). Follow the process every time they need in. One way or another you have to give them access. You said it was in the By-Laws that they have access. Get them access. There are ways to protect yourself (A code that only they know that you can verify was used to break in). But just trying to avoid letting them in is not going to end well for either of you. There are times to stand and fight and other times to play nice. In this case it is not the hill I would want to die on, so I would find away to get them access. @Teddy Johnson I understand your concerns, I lived in a Condo for +10 Years, but i doubt you will have little recourse. Talk to an Attorney for legal advice. 1 additional thing you could do is puut up Cameras in your house so you can monitor them while they are in your unit. I will just leave door unlocked that day and see what happens. If I put in the lock box it'll still give them an opportunity to make key copies. I don't want to fight with them, but this is ridiculous, especially when they can reschedule 3 more times this year. What's your opinion, here are the rules for right of entry. I believe it is non-emergency and I should have the right to reschedule when they are here the next 3 times this year. They use the word "reasonable" several times (hate language like that because it is open to interpretation). Anyway, I read it as yes - you do have to grant them access for their inspections - but no - you don't have to allow it when you have a conflict of schedule. It says nothing about you providing a key - just "access". I agree that, unfortunately, the term "reasonable" is subjective. So if the issue ever winds up in court, a judge could rule either way depending on his/her interpretation. You might want to use Google to find out if there is any case law on the subject. If you're not ready to meet them in the court, it's wise to have good relationship. I like the suggestion that you hang a lock box - nobody will have time to make the copy of the keys while inspector is moving between units. If you do suspect that the copy of the keys were made, change the locks. I'm going to call BS on the HOA needing to access the unit WITH THE ALARM COMPANY. The detectors in your unit are unlikely to be connected to the building alarm system. Can you imagine setting off the whole building and having the fire department roll every time someone burned dinner? This doesn't actually pass the smell test. FYI, I sold real estate for 5 years but I also tested, installed and repaired fire alarm systems for 7 years in Boston, MA including all the major hospitals and many apartment buildings. The smoke detectors in the units were all battery operated. Only the detectors in the hallways, common areas, mechanical spaces were hard wired to the system. What does the law say about someone forcebly entering your home? As has been pointed out several times in this thread, you may have the right to stand up to the HOA, but you have to ask yourself if it's wise. The path of least resistance here is to work with the HOA. This is one of those instances where it pays to learn how to change a lock. Because that's what this is all about, really. Most likely a $20 lock that anyone can defeat with a cordless drill and a twist bit. @Teddy Johnson , you're certainly right to resist this arrogant exercise of power. But is it necessary? In the end, are you just shooting yourself in the foot simply and only because you're worried about the difficulty of something as simple as changing out a $20 door lock? Your profile says you've done 6-20 deals...if you haven't changed out a lock yourself yet I guarantee you will have to do it in the future. It's a great time to learn.